Our meal at the Nanda restaurant in Bagan was fine, just fine. But it wasn’t very Burmese. Photo by David Lansing. I’ve been complaining to our guide, Sai, about not getting a chance to eat any traditional Burmese food. So yesterday he took me to a place where, he promised, I’d have a good meal. The restaurant was called Nanda. To get to it, we had to walk by a couple of grand tourist shops (which should have immediately set off alarms) and once inside were seated at a long table filled with German tourists who had just arrived by bus. Obviously this wasn’t going to be what I had in mind when I asked Sai to take me to a traditional Burmese restaurant. Burmese culture is characterized by onana, the all-pervasive avoidance of doing anything that would offend. Thus you never touch a Burmese on the head (not even children). You always allow the oldest people in the room to eat first. And you take foreigners to mediocre restaurants because you know they would be offended being offered fermented fish or a laphet thoke salad (pickled tea leaves) or a sour soup made with tamarind. 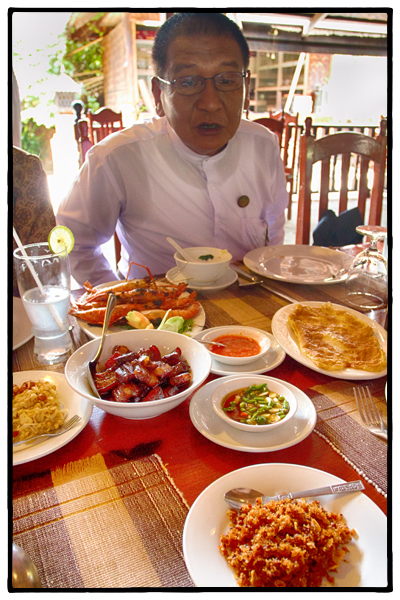 Instead, Sai ordered us large prawns, simply prepared, rice fried with peas and pork, and a large omelette. The best I can say about the meal is that nothing we were served was offensive. Which, I’m sure, is exactly what Sai was hoping for.